10/16/2008Share this story on Facebook! ICTV's "This Week Tonight" is an all-student production. 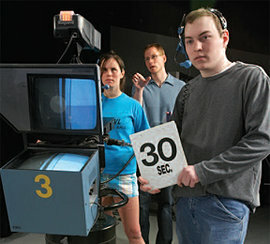 The Fall 2008 issue of ICTV's newsletter, The Monitor, celebrates the station's 50th Anniversary. It includes an introduction from station manager Stuart Kenney '09, as well as information on the 22 shows ICTV is broadcasting this semester. Read about another ICTV production in ICView, Ithaca's magazine for alumni, parents of current students, employees, retirees, friends, peers, and neighbors of the College. When I first visited Ithaca’s Park School of Communications, I was told that hands-on experience was a big part of the television radio major. But I didn’t know how true that was until I went to my first class, Introduction to Media Production, which was held in one of the school’s two television studios. That’s when I knew I was at the right college. The Park School is also where I heard that the student- operated TV station, ICTV, was having rush night, where student producers would recruit cast, crew, and writers for the semester. I decided to check it out. Being a big fan of The Daily Show and The Office, I was thrilled to find an ICTV show -- This Week Tonight -- that combined similar studio and on-location production. I ended up writing for the show, attending studio shoots, and learning the editing process from students who had worked on the show before. Later in the semester, Jeff Goodwin ’10, one of the show’s producers, approached me about becoming a producer for This Week Tonight. I knew the position would be challenging, but I was definitely up for it. Jeff and I completed a show proposal that outlined our production plans for the semester; these plans needed approval before we could begin. I hadn’t realized how formal the proposal process was, and it gave me the feeling that I was working in a professional studio in the entertainment industry -- exactly the type of experience I would need to work at a television studio after I graduate. The show was picked up for another season, and we immediately got to work. Spring semester rush night was held after winter break and we had cast auditions a few days later. At the first writers’ meeting, the staff brainstormed plot ideas. Soon enough the first episode, including studio segments and scripted character scenes, was written. But having a script for an episode is one thing -- transforming it into a television show is quite another. That’s when I really felt my job as producer truly begin. For This Week Tonight, the producers have to work with the many members of the cast and crew, in and out of the studio, to fine-tune performances and technical aspects of the show, including lighting, sound, and camera work. Because the shows are all student run, fellow classmates and friends are working with (and learning from) one another. Shooting an episode takes a lot of time and effort, but when it starts to come together, it’s exciting to see the finished product taking shape. 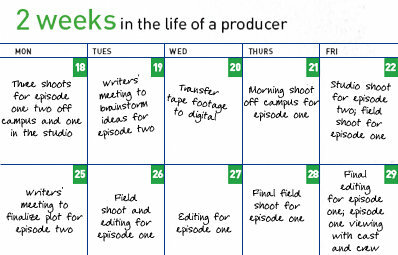 Once an episode has been filmed, the producers must put it all together. I watched the footage, deciding which shots were best and putting all of the scenes in order. It gets tedious at times, but when you’re done, you get to experience something that, in my opinion, is the very best part of working on any television show: watching it. Watching This Week Tonight as a producer was such a rewarding experience. It was great to see the end result, watch others be entertained by what I created, and know that I had an impact on something that would be enjoyed by friends, family, and all those who tune in to ICTV. Taking on the challenge of becoming a producer for ICTV was the best decision I made that semester. I got to know people who shared a common interest in television, and even though I knew nothing about the production process before I started, other students were ready and willing to answer any questions I had. It’s amazing to work in such a collaborative environment and know that my experiences here will be directly applied to my post-college career in comedy.